We have teamed up with CustomView.com to introduce a new and exciting feature to NaturalTrends.com! CustomView® is the ultimate online sampling, distribution and marketing application that provides suppliers and distributors with a wide array of tools for virtual product sampling, interactive collaboration, product management and promotion. It has in-built capabilities to execute online promotional campaigns and measure the response metrics of your target audience. This is a creative interface with multiple tools for designing and personalizing your virtual product samples. Clicking on our "Create a Virtual Sample" links throughout the website will open a popup window with a photograph of the current product. 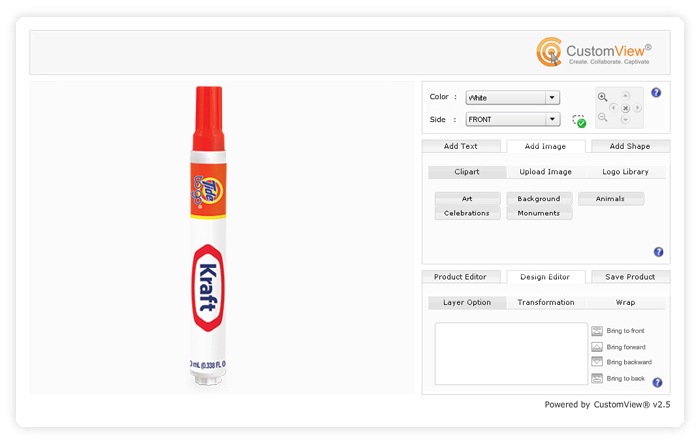 From there you may upload and add any logo graphic to the imprint area of the product photo. • A user interface for co-branding that offers space for displaying logos to achieve maximum brand visibility and establish your brand identity. • Support for multiple languages, multiple product colors, rotating views and zoom in/out for better viewing angles. • An eraser for removing the existing logo or artwork from your product and a 'Revert' option that allows retracing your steps if required. • Print custom text on your product using custom font types, style, color, size, curvature, arch and other parameters. • Adding images to your product by using your own clipart and logos in different graphic formats, or upload complete libraries. • You can store uploaded images, make the background transparent and apply various display effects. • Adding shapes to your product by applying custom shapes and color these with 'line' and fill' color options for creating a multicolored designer product. • A design editor for layering multiple assets, to transform images and text by scaling, skewing, etc., for maximum impact, and wrap text and images for proper alignment and clarity. • Save options for saving your creations in PDF or image format, to send as emails or simply print on your product or other suitable media. If you want a more precise virtual of what the label will look like on a product, please visit out Art Specs page and download the PDF layout template for that product. You will then be able to lay out your logo on the label along with the required FDA product identification info. If you upload a logo in .AI format (Adobe Illustrator), make sure that the file has been saved with PDF compatibility, otherwise it will not display correctly and you will see only lines of text on a white background. In addition to the logo, the majority of our products also include FDA required product identification on the label. This is often placed at the bottom of the label, as can be seen on the product photos on our website. If you would like to produce a virtual with that FDA product identification information included, to more accurately reflect the final look of the product, please visit our Art Specs page and download the layout template for that particular product. You can then lay out the logo on the label with the FDA info included. CustomView allows you to upload or change your logo into any imprint color you choose. Please keep in mind, however, that our standard imprint colors still apply, as do upcharges for multiple colors, halftones, or PMS matches. See our Art Specs page for more information.